UPS is supporting Dementia Awareness Week by delivering Dementia Friends Information Sessions to all our staff to raise awareness and improve understanding of what it’s like to live with Dementia. Two of our Directors, Ian Grimes and John Graham, are Dementia Friends Champions after completing a full day induction in March 2017. 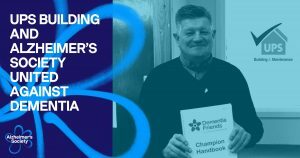 Dementia Friends Champions are volunteers who encourage others to make a positive difference to people living with dementia in their community. They do this by giving them information about the personal impact of dementia, and what they can do to help.